SpecWar master Richard Marcinko has revealed classified, kill-or-be-killed operations in a series of New York Times bestsellers: Rogue Warrior, his #1 blockbuster autobiography, and four scorching Rogue Warrior novels. Now in an electrifying new adventure, the Rogue Warrior battles an ultra-secret, ultra-lethal military plot. 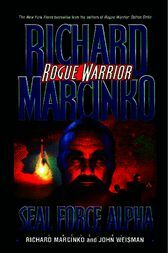 AS A US NAVY SEAL, RICHARD MARCINKO KNEW NO LIMITS—AS THE ROGUE WARRIOR, HE OBEYS NO RULES! The Rogue Warrior's taking a flying leap—a high-altitude jump over the South China Sea. His mission: scuttle a Chinese freighter's cargo of nuclear hardware and its crack crew of naval commandos. It's a leave-no-tracks, take-no-prisoners operation—in short, business as usual. But on board Marcinko makes a chilling discovery: a cache of state-of-the-art command and control equipment, all made in the USA—and primed for America's destruction! Marcinko takes his findings back to Washington, where he runs into a wall of doublespeak and double deals. But not everyone wants to see America go down the drain. General Tom Crocker, chairman of the Joint Chiefs of Staff, unleashes the SEALs of war—Marcinko and a Pentagon-based unit, SEAL Force Alpha—to neutralize a global maze of political deceit that begins all too close to home. The Chinese sense victory. They have a mole in the White House, and five thousand years of military strategy on their side. But neither the traitor nor all the wisdom of Sun Tzu are prepared for Marcinko and his men. They, after all, live by the Rogue Warrior's Tenth Commandment of SpecWar: "There Are No Rules—Thou Shalt Win At All Cost."